If you’ve enjoyed Yin Yoga, you know that it is a slow, peaceful approach that can help nourish body, mind and spirit and provide the insights and awareness of a meditative practice. There are both physiological and spiritual underpinnings to the practice, combining elements of classical Yoga, Traditional Chinese Medicine, and Mindfulness Training. This program qualifies for 14 CEUs with Yoga Alliance and is a hands-on intensive featuring lessons in anatomy, asana modifications, sequencing, benefits and precautions. You will also be given the opportunity to practice-teach Yin Yoga with your fellow trainees. We’re so excited to help guide you towards a deep understanding of Yin Yoga so that you and your students may reap the benefits of a nourishing and powerful practice. This 14-hour training is ideal if you are a yoga teacher or student who wants to explore mindfulness-based Yin Yoga to add to your teaching repertoire or your personal experience of yoga. 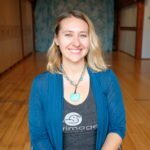 You will learn the theory behind Yin Yoga, study relevant points about asana and anatomy, and explore how to guide Yin as a supportive, safe, and deep inner exploration. $225 if registered by June 11th, $275 after. LAST DAY TO REGISTER is June 25th.